Canal pioneer James Brindley might have been a brilliant engineer but did he hack it as a planner? There’s no doubt that his Grand Trunk Canal streamlined transportation like nothing since the Roman Roads. But why didn’t he put a towpath through Harecastle Tunnel. Surely he must have seen that taking the horses over the hill while boats were legged through would result in troublesome delay. Was it bad planning or something else? See what I mean – bad planning. So why didn’t Brindley foresee the bottleneck problems, he was after all undertaking a superlative communications innovation that some were calling the 8th wonder of the world even before it opened. Andy Perkin is chairman of Potteries Heritage Society and a canal enthusiast. Brindley is armed with his surveying equipment. “You need to understand who James Brindley was and what he was doing at the time,” says Andy. “He was a trained millwright who developed exceptional skills in dealing with the control of water. Brindley was miles ahead of anyone else in mine drainage and flooding. Employed by the Duke of Bridgwater as a consultant engineer to work with the Duke’s own engineer John Gilbert, they built a canal from Worsley to Stretford in 1761. 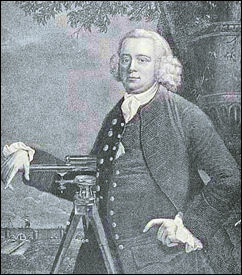 This caught the eye of Josiah Wedgwood who wanted Gilbert to construct a canal for transportation of clay to the Potteries and ware to the ports. With Gilbert he’d get Brindley. But Gilbert wasn’t available so Brindley came alone. Straightaway unique problems were seen negotiating Harecastle Hill at the bottom tip of the Pennines. But why no towpath, I wonder. “Again we shouldn’t forget that an undertaking of such magnitude had never been done before. Brindley was dealing in exacting innovative measurement and he planned his tunnel to meet nine-foot diameter dimensions in order to determine a seven-foot width of the boat. Why – because of financial restrictions. The Mersey canals and existing manufactured waterways were fourteen-foot wide and there’s no doubt that had the resources been available Brindley would have gone for fourteen-feet. The compromise seven-foot width on his canal at least allowed for two boats to float side-by-side at their destination. The financial constraints were mainly governed by the cost of getting through Harecastle. How did Telford’s tunnel improve things? “Well the commissioners had been taking advantage of the coal found during the excavations of Brindley’s tunnel and cut a number of branches inside purely to get the minerals out,” Andy explains. “This made navigation more difficult. Telford sealed off these mine warrens inside Brindley’s tunnel while he was constructing his new tunnel which he designed to a diameter of thirteen-foot including a purpose-built towpath throughout its length. There’s no doubt Telford’s tunnel was state-of-the-art. But of course fifty years had passed and the Industrial Revolution had introduced startling engineering advances. Nevertheless, in his time everybody was in awe of Brindley. 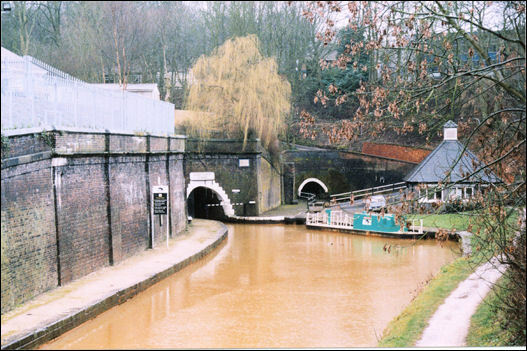 These days the two tunnels sit side-by-side and the Telford Tunnel is a very popular experience for pleasure boat tourists. 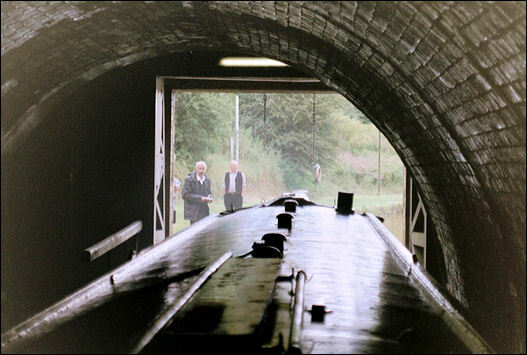 David Fearn is one of two British Waterways tunnel stewards on duty. He tells me that since the increase of canal cruising some 6000 boats pass under Harecastle each year. David and his wife Frances are retired. They live on the canal and travel around entertaining with karaoke in pubs wherever they set anchor. Later I meet up with the Shaw family from Llandudno Junction. They’ve come to Stoke on Trent especially to experience the journey through Telford’s tunnel. “It’s something we’ve wanted to do for ages,” declares parent Nigel Shaw. And something I’ve always wanted to do is to follow the horse’s route over the hill to meet my boat on the other side. The Shaw’s and I arrange to put this to the test, they by water and me by road. I’ll tell you how we went on next week.